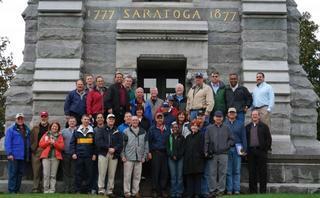 Research, Development and Engineering Command senior leaders conducted a staff ride to Saratoga National Battlefield in Stillwater, N.Y., on Sep. 29 in order to relate one of the most decisive battles during the American Revolution to the current conflict in Iraq and Afghanistan. The staff ride concept originated in the mid 19th Century with the German general and theorist Helmuth von Moltke, and consists of an intensive study of a specific campaign or battle, a visit to the actual sites associated with that campaign, and an opportunity to integrate the lessons derived from each. The staff ride provided each participant with a deeper understanding and appreciation of how their jobs impact the Soldier in theater, according to RDECOM historian and staff ride coordinator Jeffrey K. Smart. The participants visited a number of different sites related to the Revolutionary War Saratoga Campaign, including Freeman's Farm, the Barber Wheatfield, the Breymann Redoubt, and the Saratoga Monument. At each site staff ride members analyzed both American and British battle tactics. They also discussed how the organization they work for would have benefited the Continental forces at Saratoga. Smart explained that staff rides can be extremely beneficial to all those involved. "Staff rides benefit senior leaders by having them think about leadership roles and the decision making process in times of crises. They study both poor decisions and brilliant strategies while standing on the spots where the action took place," he said. "I think [the staff ride] is important...standing out there and listening and talking...it's all going to come back to you," RDECOM Commander Maj. Gen. Paul S. Izzo said in support of the staff ride. "Just to get the concept of what happened here is unbelievable." "It allowed me to analyze current techniques that G2's use, and see how they applied back in the 1700s," RDECOM security officer Dr. Sandra Gibson said. "For instance, we still study similar applications in military operations, such as weather, terrain and communications, and all those were important back then as they are today." Discussing the Saratoga Campaign on site led to many comparisons between the invading British Army during the American Revolution and the U.S. Army entrenched in Iraq and Afghanistan. RDECOM Command Sergeant Major Hector G. Marin also made a comparison between the logistical problems the British encountered in 1777 with the logistical problems that currently plague the U.S. Army in the Middle East. "The British generals couldn't be everywhere on the battlefield at once, and it took a while for information to get back to them, which prevented them from making good, immediate decisions, and we're seeing some of that in Afghanistan right now," Marin said. Maj. Thomas Rider, Assistant Professor of History for the United States Military Academy at West Point, N.Y., who specializes in the American Revolution, assisted the staff ride participants by briefing the members on the Saratoga Campaign, including key individuals, key sites, and key terms, and he also moderated discussion on the field during the exercise. "The staff ride was a tremendous success. The participants studied the campaign prior to the staff ride and were prepared to discuss strategy, tactics, personnel, and terrain issues," Smart said. "We are planning the next staff ride to Little Bighorn Battlefield in Montana for the June 2010 time frame."